September 29, 2016 was just an ordinary rainy day in the Philippines. 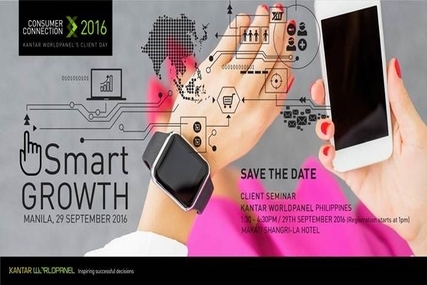 But as most of us enjoyed a warm cup of coffee to nullify the drowsy spell of the rain, Kantar Worldpanel Philippines gathered the most brilliant minds working on the FMCG industry in a single conference room with one agenda in mind: How to achieve SMART GROWTH. It was a twopart event where in the morning; an exclusive invitation was sent and acknowledged by 12 CEOs and leaders of the major players in the Philippine market today. Imagine, 12 giants. To set the event in motion, our very own Marcy Kou enlightened the audience on the challenges and opportunities on capturing the consumers’ attention and growing relevance of our brands in today’s fast-paced digital world. With the insights from Marcy’s speech still fresh, Sir Gabbs Buluran, General Manager of Kantar Media, then layed out the battleground that the titans in the room are currently playing in. Media, a highly strategic tool discussed by sir Gabbs, continues to expand and reach more Filipinos through different platforms. After what has been discussed, the questions needed to be answered were, “How do we utilize Media to our advantage? How do we measure the impact of our investments to our P&L?” And with absolutely zero hesitation, Carles Duran and Des Deocareza delivered a piece which broke through the standards of research and analytics. Finally, a method which connects actual purchase behavior to media campaigns was discussed, not just to figure out the impact but also to know how to better connect with Consumers targeted by these campaigns. While we could have finished the morning session right there, we chose not to. Instead we decided to cap it off by inviting a “small” company called Google. Yes, THE Google. We were filled with utmost gratitude when Kenneth Lingan, Country Head of Google Philippines, accepted our invitation to speak of yet another battleground for brands in the form of Smartphones and what he described as the “Micro Moments” that consumers spend while utilizing these devices. As fully-loaded as the morning session, more than 50 of the key people behind different brands and including their marketing insights teams were the audience of the afternoon session. This round, we had two of our account directors to discuss the hottest opportunities for growth in the Philippines plus a repeat of Carles’ and Des’ paper. Diwa Manila, delivered a first class and very thorough analysis on the happenings behind the purchase decisions of the generation we identify as Millenials. Not to fall behind was Ruth Sazon who then relayed razor-sharp insights on the rural but rapidly developing regions of Visayas and Mindanao. Both pieces went over and beyond the “usual” Worldpanel analysis and were received with regard by the audience. As we received feedback that the event went above the expectations of a great majority of our clients and attendees, we have nothing but gratitude to every single person who contributed to the event. Though I may not be able to list all of you, I am sure that you know how you have helped us develop and execute an event with such quality. Thank you!